Pirelli’s first “Green Performance” tire, the CINTURATO P7™ ALL SEASON has been created to take full advantage of the latest materials, structures and tread pattern design in order to guarantee savings, respect for the environment, comfort and safety on all road surfaces. 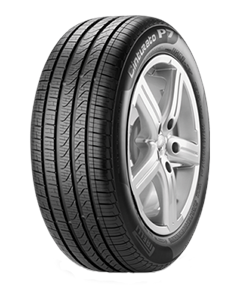 Pirelli CINTURATO P7™ placed amongst the highest in ADAC summer tire testing, confirming its leadership in terms of performance, safety and eco-compatibility. ENERGY™ EFFICIENT: Up to 20% less rolling resistance as a result of the improved tread compound, sidewall geometry and internal tire structure. Result: Reduction of almost 4% in fuel consumption and CO2 emissions. CLEAN AIR: In addition to the reduced fuel consumption and emissions, the Cinturato Family is 100% free of highly aromatic oils, due to its new, specially developed polymers and the process used to mix the compound. Result: Minimized toll on the environment. LOW NOISE: Lower road noise thanks to a special tread profile, carcass design and materials. Result: Noise reduction of 1dB corresponding to a 30% reduction in subjectively perceived tire noise. HIGH MILEAGE: Improved performance through optimizing the tread contact area, tread compound and profile design. Result: Increased average tire life while maintaining high safety characteristics and performance. Great service, exceptionally knowledgeable personnel, 4x4 specialists, great prices. Highly recommended. Recommended by a local friend there and they did a great job quickly and fair price. Excellent service, great advice from the guys and no pushy sales. Provided great advice on suitable tyres for my Caravelle and fitted at my convenience. Prices were as good as online and also so nice to deal with a company who really care about the customer.